The gold rush to the Klondike River in the late ‘nineties paved the way for the railway engineer in the north-west of the American continent. Since the first railway in this region was opened, in 1899, several other lines have penetrated northwards towards the Arctic Circle. THE LURE OF GOLD. 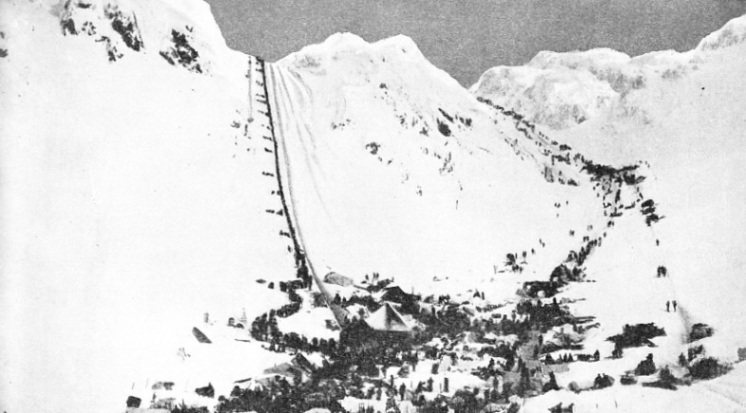 Two lines of gold-seekers climbing over the Chilcoot Pass on their way to the Klondike River. Those on the left are following a guide-rope. This remarkable photograph was taken by one of the gold-seekers in 1898. Railway prospectors favoured a route from the head of the Lynn Canal, on the Pacific coast, across the Coast Range, either over the Chilcoot Pass or over the White Pass, to Lake Bennett, on the Upper Yukon River. The route over the White Pass was eventually chosen. From Lake Bennett the gold-seekers drifted down the Upper Yukon River to the Klondike in small boats built by themselves. OF the many achievements of the railway engineer, few are deserving greater recognition than his work in Alaska, that vast territory of towering mountain ranges, swiftly-flowing rivers, great lakes and mighty glaciers, lying on either side of the Arctic Circle. Although Alaska belongs to the United States, British capital was responsible for unlocking the vast mineral resources and other wealth of this great territory. Great Britain supplied the money for building Alaska’s first railway, the famous White Pass and Yukon Railway. Since then other railways have been built in this region, some of them within a few miles of the Arctic Circle. They are among the most northerly railways in the world, and their surveying and construction called for all the resources, daring, pluck and ingenuity of the engineer. Until fairly recently the popular conception of Alaska was of a mountainous land, most difficult to penetrate, and snowbound and icebound for the greater part of the year. This is only partly correct. Alaska is rich in all the valuable minerals, more particularly in coal and copper, and gold is still found there in paying quantities. Its timber resources are considerable and its fisheries copious. The mountain valleys are wonderfully fertile, and an Agricultural Experimental Station has been established to encourage the cultivation of vegetables and other crops. True, in the winter snow covers the ground to a depth of several feet, and the mercury drops to 40 or 50 degrees F. below zero, but in the summer temperatures of 80 and 90 degrees F. are known. The winter grips the country for nearly two-thirds of the year, and the summer lasts barely 100 days. But during the summer the sun shines from a cloudless sky the whole time, and for some twenty hours throughout the day. It is thus possible to sow and to harvest crops within eighty days. Not least, Alaska is becoming a popular touring ground. Its magnificent alpine and unique river scenery, the presence of big game, and the fishing in its lakes and streams are attracting large crowds of visitors every summer. Two tracts of territory, known as National Monuments, have been set aside by the Government as playgrounds for the people. The Mt. McKinley National Park, some 2,000 square miles in extent, is a great natural reservation, famed for its big game and lovely alpine scenery, centring in Mt. McKinley (20,300 feet), the highest peak on the North American continent. The other reservation is a geological wonderland, known as the Valley of Ten Thousand Smokes, the strangest volcanic region in the world, discovered only a few years ago. This is a great valley about thirty-two miles long, with an average breadth of two miles, the whole dotted with innumerable vents from which issue hissing clouds of vapour. The valley is situated in the Kodiak Peninsula and the phenomenon was caused by the eruption of Mt. Katmai on June 6, 1912. The discovery of gold and the subsequent rush of 1893 and 1839 to the Klondike River brought about the unlocking of Alaska, and was responsible for bringing a country of 586,400 square miles within the purview of the railway builder. There were several routes to the goldfield. The one mostly favoured, because it was the shortest, was that across the Coast Range from the head of the Lynn Canal, on the Pacific coast, either over the White Pass or over the Chilcoot Pass, to Lake Bennett, on the Upper Yukon. Prom that point the gold-seekers drifted down the rapid waters of the Yukon River to the Klondike in small boats built by themselves on the banks of the Yukon. As the gold-seekers were unable to negotiate the passes in the winter months, it meant that those arriving at the coast at that season of the year had to remain there till the spring before they could proceed inland. A town of wooden shacks and tents, known to-day as Skagway, sprang up at the head of the Lynn Canal. The early gold-seekers endured untold privations to gain the new Eldorado. The trail was blazed with the bleached bones of animals and of pioneers eager to be first on the spot. In one of the worst places on the trail there were over 3,500 dead horses in a distance of a mile. It was an eminent American engineer who conceived the idea of building a railway over the dreaded pass, thus providing an easy and rapid access to the Yukon River. He had had previous experience in railway building in mountainous and difficult country. Having failed to obtain the necessary financial help from his own countrymen, he went to London and was successful in inducing British financiers to back the proposal. The ultimate success of the enterprise led the American financial world to regret its refusal to support the scheme. Alaska’s pioneer railway of 110 miles in total length called for an expenditure of £850,000, but it proved worth while. THIS short railway, known as the White Pass and Yukon Railway, extends through three different jurisdictions. The first twenty miles, from the sea at Skagway to the summit of the White Pass, run through United States territory; from the summit to the shores of Lake Bennett, twenty miles farther, the line is the Canadian province of British Columbia; and thence for the remaining seventy miles to White Horse it is in the Yukon Territory of Canada. Building was begun in 1898, while the Klondike rush was at its height, a factor which greatly increased the difficulty of securing and keeping an adequate supply of labour. Scarcely had the work begun when war broke out between the United States and Spain. All the available shipping was chartered by the United States Government, and this enhanced the difficulty of providing transport for the men and for the material, which had to be carried 1,000 miles from the supply base on the Pacific coast to the ocean terminus of the proposed railway at Skagway. At that time there was no telegraphic communication in the area - a great disadvantage to any engineering project carried out so far away from the base of supply. 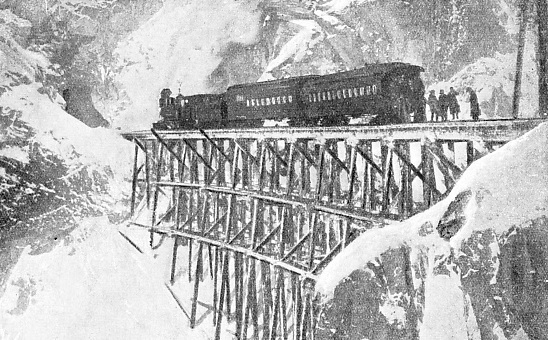 A TRAIN OF SEVEN COACHES crossing a cantilever bridge on the White Pass and Yukon Railway. This pioneer Alaskan line, 110 miles long, runs from Skagway, a township at the head of the Lynn Canal, to White Horse. The first twenty miles, to the summit of the White Pass, run through United States territory; the next twenty miles, to the shores of Lake Bennett, are in British Columbia. The remaining seventy miles are in the Yukon Territory of Canada. As the trail of the gold-seekers was not adapted for railway purposes, five preliminary surveys were made to determine the best available route to the summit. The precipitous mountainsides were thickly covered as far as the timber line (upward limit of timber) with small scrub spruce, and were polished smooth above the timber line by the action of glaciers. Thus the work of surveying was difficult. But within a few weeks the line was “located” for construction, and was made up of portions of each of the five preliminary surveys. CONSTRUCTION work upon the railway had gone on for some two months when news came into the camps of the discovery of a new gold-strike at Atlin, not far distant in British Columbia. At that time the construction staff numbered 2,000 men. They were toiling with great zest, contented with their lot. Many of them had tasted the bitterness of ill luck at the Klondike. But the news of the new goldfields awoke all their slumbering ambitions. As many as 1,500 men threw down their tools and clamoured round the pay-office of the engineer for the wages due to them. As the wages were paid the men stampeded off to see if Fortune could be wooed any more successfully at Atlin than at the Klondike. It was two months before the working strength could be restored. By that time the work was almost entirely above the timber line, and exposed to the full force of the Arctic winter storms. In many places the men had to be roped together while working, to prevent them from being blown off the mountainsides, where the granite was so smooth and slippery that the only foothold was #often obtained from logs chained to iron bars drilled into the rock. The cold and the action of the wind were so intense that the men had to be relieved every hour, as longer exposure numbed not merely their bodies but their minds, so that they had not sense enough left to tie a knot securely or do other simple things of similar nature. Throughout the winter the thermometer at the construction camp ranged from 20 to 40 degrees below zero, and sometimes even lower. The work, however, went on continuously, and on February 18, 1899, the first train reached the summit of the White Pass, 2,865 feet above sea level, and twenty miles from Skagway. After the summit had been reached, the working force was transferred to the comparative shelter of the timber at the Bennett end of the line for the remainder of the winter, as there was no special object in continuing to expose the men above the timber line on work which could be done more easily during the spring. Meanwhile communication between railhead at the summit and the construction camps beyond was maintained by an iced roadway. The traffic soon ground down the road into one of the best highways imaginable for either fast or heavy sleighing. In addition to construction material and camp supplies, an immense passenger and freight business, was carried over the road during the spring of 1899. Among other things carried were the boilers, engines, and woodwork for a fleet of steamers built at Lake Bennett that spring, so that, when the railway reached the lake and navigation opened, there was a fleet ready to carry traffic down the Yukon River to the Klondike. As the spring advanced and the ice melted, the road was kept up with increasing difficulty, till finally even light traffic by night became impossible. By the following July the rails reached Lake Bennett, some forty miles from Skagway, and a passenger service was inaugurated. Beyond the gravel flats at Skagway, the line followed rocky mountainsides deeply serrated by fissures and canyons. From the fourth to the twenty-eighth mile the road bed had to be blasted out of the solid granite, except where bridges occurred, and every ton of ballast had to be hauled from Skagway as there was no loose gravel or soil available for ballasting on the rocky sides of the mountains. A 500-feet tunnel on the sixteenth mile, high up on the slippery side of Tunnel Mountain, was inaccessible from the grade line, being cut off by a deep canyon, which was not bridged till after the tunnel had been completed. Meanwhile the powder, steam-drills, fuel, and water required for work on the tunnel had to be carried on men’s backs up the steep mountain by a zigzag trail cut in the precipitous granite. Snow to a depth of from 25 to 30 feet had to be removed from the more exposed portions of the line, and even in sheltered places the snow was from 6 to 7 feet deep. Upwards of 500,000 cubic yards of snow and ice had to be removed in clearing the line for work. 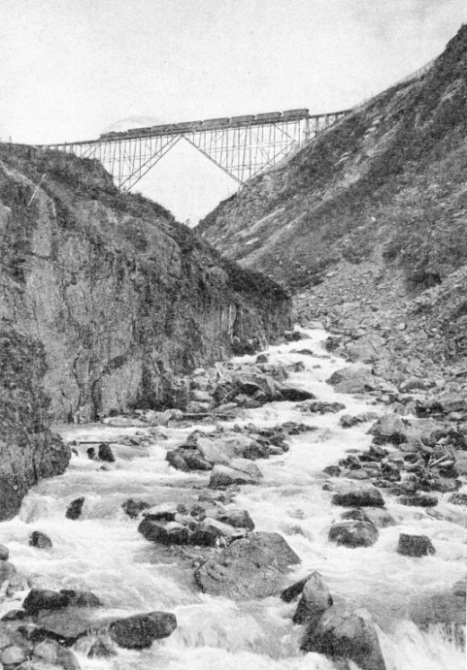 Sixty-seven bridges, aggregating 11,540 feet, had to be built, many of them over deep, inaccessible canyons. In view of the engineering and climatic difficulties, a year was a remarkably short time in which to complete the forty miles of line through the mountains from Skagway to Lake Bennett. From this lake there is a continuous waterway down the Yukon River to its mouth at St. Michael’s, over 2,003 miles distant, and by means of the sundry lakes and tributary rivers there is water communication with almost the whole of the interior. This extensive system of waterways is, however, available only for comparatively small boats bound downstream. Hence for all commercial purposes the head of navigation on the Yukon begins at the foot of the White Horse Rapids. Thus it was necessary to extend the railway to that point, a distance of seventy miles from the southern end of Lake Bennett. Work was at once begun. For twenty-seven miles the line was planned to run along the shore of the lake. This involved a great deal of heavy rock work, upon which progress would be slow. It was therefore decided to establish camps for the rock gangs only along this part of the line, and to transfer the remainder of the working force to the foot of Lake Bennett, and put them to work between Caribou Crossing, at the foot of Lake Bennett, and White Horse Rapids. If this latter portion of some forty-three miles could be completed by the time navigation opened in 1900, the lake would form a connecting link between the two pieces of railway until the gap could be closed by completing the railway along the shores of the lake. To carry out this programme successfully, it was necessary before navigation closed in 1899 to assemble at Caribou Crossing a supply of rails, sleepers, construction plant, and material, in addition to rolling stock and camp supplies, sufficient for nine months’, work and the building of forty-three miles of railway. Once navigation closed on Lake Bennett the work beyond would be cut off from railhead until the lake was again free from ice in the following June. 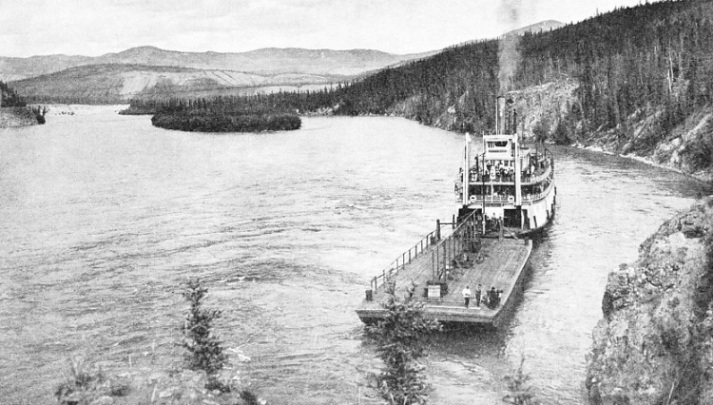 The lake steamers already mentioned were fully occupied in the Klondike traffic, but the railway folk hastily built steam barges of large size, and with their aid were able to accomplish the task of getting everything to Caribou Crossing before the ice closed navigation in the autumn of 1899. AT FIVE FINGER RAPIDS, on the Yukon River. The river steamboat White Horse is towing a barge. From White Horse, the inland terminus of the railway, comfortable passenger steamers go down the Upper Yukon River to Dawson City, chief town of the province of Yukon. Near Dawson City is the confluence of the Klondike River with the Yukon River. The discovery of placer gold in the streams feeding the Klondike led to the gold rush of 1898-99. The Yukon River, flowing through Canada and Alaska, is 2,300 miles long. Work was pushed on vigorously throughout the winter, but great difficulty was experienced because the ground was frozen, not merely for a few feet below the surface by the winter frost, but to a great depth by the glacial cold of prehistoric ages. The frozen earth proved to be more difficult to deal with than solid rock, as, having no cleavage lines, it was tough, in addition to being as hard as rock. When the spring came, cuttings made in this frozen earth began to thaw and run, and embankments made with the frozen material began to melt and settle down, and soon the surface of some of them was 5 or 6 feet below the grade line. All this involved constant refinishing of the line, and a great deal of extra work; yet the first train ran from Caribou Crossing into the new town of White Horse on June 8, 1900. By that time the ice had melted on Lake Bennett, and navigation was open, so that with the aid of the steamers on the lake through communication was at once established between Skagway and the foot of the White Horse Rapids. During the winter and spring work had been progressing steadily along the rocky shores of Lake Bennett, where the heaviest work consisted of blasting a road bed round or through the numerous steep, rocky capes which jutted out into the deep water of the lake. These capes were separated from one another by little bays, at the head of which the water was for the most part shallow, so that the material taken from the rock cuttings on the capes was used in some places for building embankments across the shallows; Thus curvature of the line was avoided as much as possible. By the end of July 1900 the twenty-seven miles of line along the shore of the lake were completed, and the last spike was driven on July 29, thus closing the gap between the two ends of the railway. The first train over the completed line was southbound - from White Horse to Skagway - and was composed of empty cars, which had been working on the northern end of the line. The gauge of the railway is 3 feet. In addition to carrying ordinary passengers and freight, the line attracts considerable tourist traffic in the summer months. From White Horse, the terminus of the railway, comfortable passenger steamers run to Dawson City, the centre of the Klondike, and capital of Yukon Territory. From Dawson City the journey may be made down the broad bosom of the Yukon, past Fort Yukon, which stands on the Arctic Circle, to the confluence of the Tanana River. On this tributary stands the township of Fairbanks, starting-point of Alaska’s longest railway. It is called the Alaska Railroad. This is standard-gauge line, built by the Government, running down through the heart of the country, past the Mt. McKinley National Park, to Seward, on the coast, a distance of 470 miles. The main object of this railway was to open up the interior of the country and to provide ready access to its more important mining centres, particularly the vast coal beds of Matanuska. The coal from these beds had been tried by the ships of the United States Navy and found to be equal to any obtainable elsewhere. But the planning and building of the line proved a particularly hazardous and costly undertaking. It was far too big a proposition for any private corporation to tackle. HURRICANE GULCH BRIDGE, on the Alaska Railroad, 281½ miles from Seward, the terminus on the Gulf of Alaska. The Alaska Railroad runs from Seward through the McKinley National Park, to Fairbanks, on the Tanana River, a tributary of the Yukon River. The length of the railway is 470 miles. The main object of the builders was to provide access to the important coal-mining centres at Matanuska (150 miles inland) and elsewhere. Trains normally run once a week in either direction, stopping for the night at Curry, 248½ miles from Seward. During the navigation season the trains connect at Nenana, 58½ miles short of Fairbanks, with Yukon River steamers. The Government, therefore, appointed a special Engineering Commission to carry out the project. The surveying parties which were sent ahead to locate a path for the railway had a difficult task. They were called upon to wade and swim the icy waters of glacial streams, to take their bearings while suspended by ropes over high precipices, to fight clouds of mosquitoes in the marsh and tundra of the lowlands and to drive away herds of wild animals. All this time they were planning cuts, embankments and tunnels and determining sites for bridges over the rivers which the railway was eventually to cross. The difficulties of the survey were surpassed by those of construction. The first tunnel brought this home with startling vividness. It was 700 feet long, and was almost entirely on a curve of about 400 feet radius burrowing through a projecting hump of a great mountain chain. To gain the tunnel, a broad sweep of the same radius as that of the tunnel curve had to be made, and the two works together formed two-thirds of a circle. But one portal of the tunnel opened out on the brink of a precipice, the mountainside falling away abruptly at that point. To carry the line forward a huge artificial work had to be carried out. This was a timber trestle, which constitutes one of the most outstanding features of the line. From end to end it measures 1,240 feet in length, and it varies in height from 40 to 90 feet, some of the outside members being no less than 120 feet in length. Over a million feet of timber were used in its construction. In the valleys the line is laid almost entirely upon a wooden grade, because of the absence of stable, solid ground upon which to raise embankments. The rivers are spanned by steel bridges ranging in span from 80 to 100 feet. More than 50 per cent of the work through the canyon on this route is tunnelling, which aggregates 2,800 out of 4,800 feet. There was no other way of overcoming the abrupt cliff sides, and but for the rifts and clefts in their flanks the length of the tunnels would have been greater. This work occupied much time, for the rock was found to be intensely hard. There are many small railways in Alaska built by private enterprise. One of the earliest and longest of these is the Copper River and Northwestern Railway, a standard-gauge track, 196 miles long, which runs from Cordova, a port on the coast, to Kennecott, to tap the famous Bonanza Copper Mines. The most spectacular piece of work on this route was the building of the Miles Glacier Bridge forty-eight miles from Cordova. This 1,500-feet structure of steel, consisting of four spans, carried on massive concrete piers, had to be built across the river where it makes a double turn between the great Miles and Childs Glaciers. Both glaciers present 300-feet cliff faces to the water for three miles, and every spring they precipitate into the swift current an endless flotilla of icebergs. HERE, indeed, was a problem: the building of bridge-piers strong enough to withstand not only the masses of ice being hurled against them by a twelve-knots current, but also the enormous pressure of the spring break-up of the ice. Everybody declared the feat impossible, but it was carried through after two years’ strenuous effort. Great concrete piers, begun through the winter’s ice, were driven 40 to 50 feet through the river bottom to bed-rock, and there anchored. They were built of solid concrete, heavily reinforced with steel. A row of 80-lb rails was set a foot apart all round, and the whole structure bound together within the concrete in an amazingly massive manner. Then, above the piers, ice-breakers of the same construction were raised. When the piers were finished, it was necessary to connect them with a roadway of steel, and this had to be done in the winter, since no falsework would stand against the moving ice. It was a fearful and trying task, for the workers had to contend against the bitter cold, the continual snowstorms and the piercing wind, blowing from sixty to ninety miles an hour, and hurling through the air particles of fine ice that stung the face. Work was hurried forward, and the last span of the bridge was almost in place, when it was seen that the falsework that carried it had moved fifteen inches. This falsework consisted of nearly two thousand piles, driven deep into the bottom of the river, 40 feet below the surface. The ice was a solid sheet 7 feet thick, and it was borne on a twelve-knots current. Into it the forest of piles was solidly frozen But the spring break-up had begun on the river, and the ice-cap, lifted 20 feet above its winter bed by the flood, was moving. Steam from every available engine was driven into small feed-pipes, and every man in camp was put to work to steam-melt or chop the 7 feet of ice clear of the piles. The boles were kept open throughout the day and night, and in the bitter Arctic cold hundreds of cross-pieces were unbolted and shifted while the river rose 21 feet Anchorages were hastily built into the ice above the bridge. While a gang thawed and chopped at the ice round the piles, the whole 450-feet-length of towering bridge-work was pulled, dragged and coaxed, inch by inch, back into its place. It was midnight, after an eighteen-hours’ day of one shift, before the last bolt was driven home and the span settled down on its concrete bed. An hour later the whole 450 feet of falsework became a wreck. T he most northerly of Alaska’s railways are two comparatively short lines in the Seward Peninsula, just south of the Arctic Circle. These are a narrow-gauge track from Nome to Shelton, some sixty miles long, and a shorter line of some forty-five miles from Port Dickson along the Solomon River to Council City. Although these railways can claim to be the most northerly on the American continent, in both Sweden and Russia there are to-day railways penetrating well above the Arctic Circle. ON THE WHITE PASS AND YUKON RAILWAY. 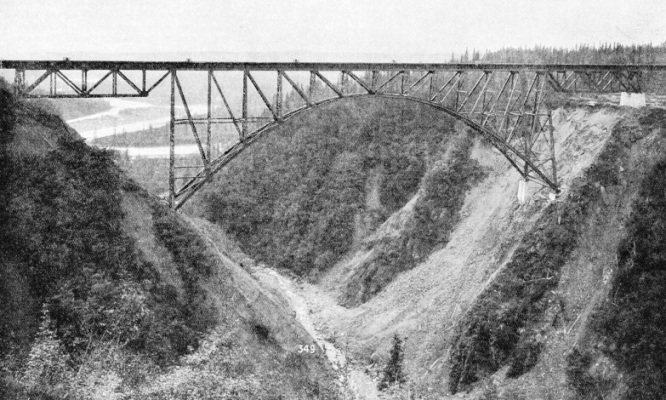 A train is standing on a trestle bridge at the mouth of a tunnel on the way to the summit of the White Pass. The building of the railway was begun in 1898, when the Klondike rush was at its height. On February 16, 1899, the first train reached the summit of the White Pass, 2,865 feet above sea level. The distance from Skagway, in Alaska, is twenty miles. You can read more on “Canada’s Streamlined Engines”, “Conquest of the Rockies” and “Mammoths of American Railroads” on this website.